It's not something that is easy to give a how to as you just kind of have to work out your wiring routing as you go. I was also fitting climate control at the time so that adjusts things. It didn't help that I didn't take any pictures either! Basically to remove the old system, find the ecu and follow the wiring from there. Going from the ecu, you go forward and up behind where the heater ducting is and remove the wiring from in the bay through that grommet. You then need to remove the 2 front seats and all the handbrake plastics and lift the carpet up to remove the interior abs wiring. It goes from the old ecu location, along the sill as far as being level with the handbrake where it splits in 2. One part goes backwards under the trim, up the inside of the rear seat trim and under the rear seats where the old system has a plug break for the sensors. The other part of the loom is the power loom, this goes under the left seat, up under the front of the handbrake where I think it split in 2 (can't quite remember!) for a feed to go off to the diagnostic block behind the centre console and the rest of the loom drops down under the right seat, goes across to the sill and then follows forward to go behind the kick panel trim and into the fuse box. When it came to fitting the new wiring, I went through the same original grommet and then feed the interior power part of the loom along the bulkhead, teeing off to the diagnostic block and going to the fuse box. The rear sensor lines traced along the left hand sill, under the trim and under the rear seats like the original system. Excellent and very thorough, thanks for taking the time mate! When you get your pics together, stick it in the wiki as this is brilliant! EnthusiastOwned, thanks for taking the time to write this up. Very useful and informative. No problem.. I will get around to doing a basic guide and I'll include photo's.. Just finding time. I spent around 1.5 hours writing that guide! Last edited by Sean_Jaymo; 12th January 2014 at 6:27 PM. Yep, that's the same image I used for mine. I think between myself and Sean_jaymo we'll get a good guide going. Just need to get my photos done. PurpleTom needs a mention too! It was Tom that put me onto this to start with so I agree, Kudos to the Diesel Rado Man himself! 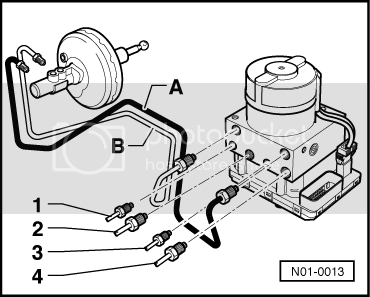 It all sounds a bit complicated and over whelming, but if you can make brake lines without wanting to break out into tears and are comfortable pulling out the fusebox, then you can do this without too much hassle. Once you have the wiring laid out in front of you, it's actually a fairly simple system that is completely standalone from other electrical systems unlike in later Teves 60 systems. Bit of copper pipe and a flaring tool, can't be too hard! How did you get on with this SeanL?